Kolomna is the former western outlying area of Saint Petersburg, and is bordered by water arteries: the Kryukov Canal, Fontanka River, Bolshaya Neva River, New Admiralty Canal and Moyka River. Several small buildings from Pushkin’s era (first half of the 19th century) have been preserved in the city. These are private houses of modest proportions and appearance, and they can be spotted easily on Pskovskaya Street: no. 14 (E. Z. Braun’s house) and no. 8 (Fomin’s house); on Griboyedov Canal Embankment (no. 17, Apraksin’s house); and on the corner of Lermontovsky Prospect and Soyuz Pechatnikov Street (E. M. Elmanovich’s house). Among these structures, 50 Pryazhka River Embankment is a striking building. It is decorated with a four-column Doric portico, and a lion’s head ornaments the gates. This building belonged to the celebrated master stonemason Samson Sukhanov, whose workers’ cooperative made the statuaries for the buildings of the Stock Exchange, Gorny Institute and the Admiralty building, the St. Isaac’s and Kazan Cathedrals and the gigantic “tsar bath” in Babolovsky Park. Alexander Pushkin lived in Kolomna from 1817 to 1820, from his graduation from the lyceum until his exile to the south. The main Pushkin address in Kolomna is 185 Fontanka River Embankment. Alas, this building was later reconstructed, and it no longer looks as it did in Pushkin’s time. However, a commemorative plaque makes it impossible to forget the most famous event in the life of this house. Unfortunately, a different commemorative plaque is missing from this house, so today nothing tells passersby that the building was home not only to Russia’s greatest poet, but also to Petersburg’s greatest architect, Karl Rossi. Rossi lived in one of the building’s apartments in the early 1840s, toward the end of his life. All his great structures were behind him, and he was so poor that he had to pawn his deceased wife’s belongings and sell tickets to his box in the Alexandrinsky Theater. Rossi died here from cholera on April 6, 1849. In the house on the corner of Kryukov Canal Embankment and Rimsky-Korsakov Street, Vasily Zhukovsky, a poet and friend of Pushkin’s, rented apartment 10 in 1818–1819 (the composer Modest Mussorgsky occupied the same apartment in 1865–1867). It was in Zhukovsky’s apartment that the first reading of Pushkin’s celebrated epic poem “Ruslan and Lyudmila” took place. Another poetic address in Kolomna is 57 Decembrists Street. Alexander Alexandrovich Blok lived here from 1912 until his death in 1921. He first lived in apartment 21, but in 1920 he moved into his mother’s apartment, no. 23. Now both of these apartments are occupied by the Blok museum, which was founded in 1980. The most unusual poetry-related Kolomna address is 23 Kryukov Canal Embankment. It was home to the great pulp writer Count Dmitry Ivanovich Khvostov. The chief procurator of the Synod (and the husband of the niece of Suvorov, the generalissimo of the Russian surface forces who was famous for crossing the Alps), Count Khvostov continually wrote poetry, published it at his own expense, and often hassled everyone around him with his verse. The only Orthodox church in the Kolomna district is the Church of St. Isidor Yurievsky on the corner of Lermontovsky Prospect and Rimsky-Korsakov Street. This church was built by an Estonian Orthodox fraternity, and the worship was originally conducted in Estonian. There were also Estonian-language services in the St. John Lutheran church (54 Decembrists Street). During the Soviet period, the church was closed and the building was reconstructed, but its former appearance has since been restored. The presence of two Estonian churches in Kolomna is explained by the fact that most Petersburg Estonians (at the beginning of the last century, they numbered nearly 20,000) lived in Kolomna. Kolomna also contains the small St. Stanislav Catholic church, dating from 1825 (corner of Masterskaya Street and Soyuz Pechatnikov Street), and the Choral Synagogue (Lermontovsky Prospect), which was built over the course of 10 years with donations from Petersburg’s Jewish community. The Great Choral Synagogue, which was constructed in the “Oriental” Moorish style, is considered one of Kolomna’s most unusual buildings. Any visitor can verify this on both the outside and the inside. Yarmulkes are distributed at the entrance to all visitors, and it is fun to try out the building’s acoustics: a whisper uttered next to one wall can be perfectly discerned from the other. 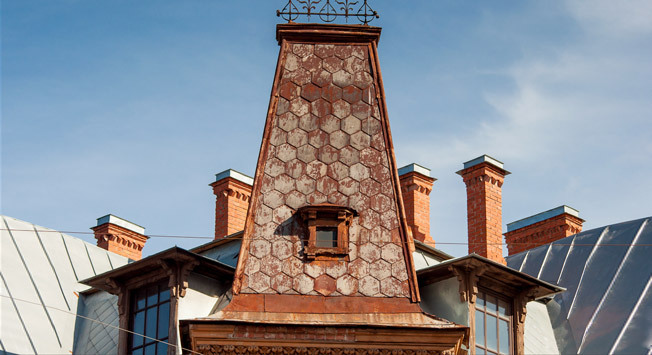 From 1872 to 1900, Schröter built six buildings in Kolomna for different purposes: a silk product factory, private houses, multidwelling units, a storehouse for sets from the Imperial Theaters. Of particular interest is the complex of three buildings belonging to Schröter—the architect’s private house (114 Moyka Embankment) and the two apartment buildings adjoining it (112 Moyka Embankment and 2 Pisarev Street). These structures greatly influenced Petersburg architecture, down to direct imitations. A stroll through Kolomna will somehow or other be connected to bridges, and the most interesting of them are considered the Old Kalinkin and Egyptian Bridges. The Egyptian Bridge, which was built in 1825–1826, used to be a suspension bridge, while its beauty was enhanced by four sphinxes on the corners. Unfortunately, in the winter of 1905 the bridge collapsed under a squadron of cavalry guards. One of Petersburg’s most famous legends is associated with this incident: one of the officer guards allegedly rejected a woman who lived nearby, and when she spotted her unfaithful lover among the cavalrymen crossing the bridge, she cried out in fury, “May you all fall in!” This happened immediately. In fact, the precise reasons for the collapse of the Egyptian Bridge are unknown. The popular version about the effect of the resonance is not apt given that horses, unlike marching soldiers, do not walk in step. The most likely explanation is the phenomenon of cold shearing, a bending of metals to fragility in low temperatures. But nowadays, it is no longer possible to believe such a hypothesis. A new Egyptian Bridge was erected in the 1950s, but the noble sphinxes of the old bridge continue to lie on their pedestals, guarding Kolomna’s riddles.